Program origins. In 1998, the Florida legislature allocated $20 million from the TANF block grant for mental health and substance abuse services. By the end of 1999, most of the local welfare offices around the state had fully implemented the TANF Substance Abuse/Mental Health (SAMH) Program for participants in the state welfare program, known as WAGES. Eligibility for the TANF SAMH Program was expanded in 2000 to target families at risk of becoming WAGES participants. Non-WAGES participants are distinguished from WAGES participants administratively, but there is no distinction in the amount or types of services they can receive. 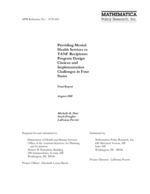 In 2001, funding for the TANF SAMH Program was increased to $45 million. The TANF SAMH Program served over 24,000 people in 2000 and the state estimates that 25,000 people will be served during 2001. Scope of barriers targeted. The TANF SAMH program targets individuals with substance abuse or mental health conditions. Eligibility for mental health services. Individuals eligible for the TANF SAMH Program are WAGES recipients and their family members and also non-WAGES families with incomes less than 200 percent the Federal Poverty Level. Services can be provided to noncustodial parents as long as both custodial and noncustodial parents are below the income requirement and are permanent residents of Florida. Also eligible for services are individuals who have left WAGES within the past 12 months, child-only cases(17), families receiving services in the Family Safety system (the child welfare agency) and individuals receiving Supplemental Security Income (SSI) or Social Security Disability Insurance (SSDI). Strategies for identifying participants with mental health conditions. There is wide variation among the local one-stop welfare offices for informing and identifying participants of the TANF SAMH program. The primary approaches used by the outreach workers are described below. Referrals by WAGES Staff. Statewide, TANF SAMH outreach workers are co-located in most of the one-stop centers at least part time. Being co-located within the office appears to help develop relationships between the outreach workers and WAGES staff, which tends to increase the number of referrals. Presentations during WAGES Orientation and Job Club Workshops. Presentations during orientation and job club workshops are one way outreach workers inform WAGES participants about the TANF SAMH Program. The frequency of these presentations varies by local office. At the Caleb One-Stop Center in Miami, participants learn about the TANF SAMH Program during the employment services provider's job club. Community Outreach. In areas where the outreach worker is not co-located within the one-stop center, there is an emphasis on developing community outreach activities to inform low-income families about the TANF SAMH Program and to encourage participation in screening and treatment. In some areas, outreach workers make home visits and work with other agencies, such as community health clinics, day-care centers, and food stamp offices, to gain access to TANF participants and low-income families. Additionally, some contracted service providers have negotiated with community agencies to co-locate outreach staff within their agencies. Types of mental health services provided. The TANF SAMH program provides screening, assessment, and treatment for participants with mental health and substance abuse conditions. Screening. TANF SAMH outreach workers use a standard 32-item survey to conduct screenings. The screening tool includes CAGE questions to detect drug and alcohol abuse and a mental health screening tool. A scoring system for the screening tools allows outreach workers to determine whether a client should be referred to treatment. There are also two emergency referral questions and seven automatic referral questions. The state requires use of the uniform TANF SAMH Program Survey, but additional questions can be added to the screening. Discretion for how broadly to screen participants is left to the local one-stop administrator. Some centers screen all WAGES participants during orientation. Others screen only participants referred by the WAGES case managers, other community agencies, or those self-referred. In-Depth Psychosocial Assessments.The outreach workers schedule intake appointments for in-depth psychosocial assessments with licensed mental health or substance abuse counselors typically within 10 days of the initial screening. The psychosocial assessments vary by treatment provider, but counselors usually speak with participants about their health status, employment and economic circumstances, drug and alcohol use, legal status, family history, and family/social relationships. In most cases, outreach workers refer participants to their own agencies. However, when the participant requires treatment that an outreach worker's agency does not provide or if there is a wait for treatment, the participant is referred to other mental health and substance abuse treatment providers within the area. Referring participants to other agencies occurs primarily in urban areas where there is more than one treatment provider. Mental Health Treatment.In general, there are few restrictions on the types of services provided under the TANF SAMH contracts. Treatment plans are negotiated with the participant and contracted mental health/substance abuse treatment provider and approved by the TANF SAMH specialist. Some agencies offer a wide variety of mental health and substance abuse services, while other agencies contract to provide a very narrowly defined service. For example, one Miami treatment provider offers outpatient mental health treatment for adults only. A second, larger, treatment provider in Miami offers an extensive range of mental health and substance abuse services for children and adults including outpatient, in-home/on-site, outreach, residential treatment, and case management for addressing substance abuse and mental health needs. The relationship between mental health services and work requirements. Florida requires participation in at least 30 hours a week of work activities, which includes job search, vocational training, work experience, adult basic education and up to five hours per week of mental health and substance abuse treatment. Participants also are assigned to one of two time limit tracks. Participants who are work-ready can receive cash assistance for 24 out of 48 months; those with more serious barriers to employment are allowed cash assistance 36 out of 72 months. Additional months may be added to a participant's time limit to compensate for months that they are actively involved in mental health or substance abuse treatment. The lifetime limit for all participants is 48 months. Participants also may obtain an exemption from the time limit. Hardship exemptions are granted when a client has been participating diligently in work activities but still has a barrier to employment or is enrolled and participating in a program that extends beyond the time limit. Participants awaiting SSI approval also are exempt from the time limits. However, most participants are granted a deferral rather than an exemption. A deferment lasts up to 90 days and allows the client to be temporarily relieved from the work requirement. Deferments are granted when there are serious barriers that limit the client's ability to work. Typically, the client must obtain a written statement from a doctor to receive a deferral. Participants who are deferred from the work requirements are still subject to the time limit. Administrative structure. The TANF SAHM Program is housed within the Department of Children and Families(18) (DCF) and operates under both the Mental Health and the Substance Abuse Program Offices but works in collaboration on policy issues with the Office of Economic Self-Sufficiency. (19) A program director and three staff members in the state office administer the TANF SAMH Program. Within each of the DCF districts or regions, there is at least one TANF SAMH specialist to oversee program activities within the local offices. All of the TANF SAMH employees are hired as OPS (Other Personnel Services) employees. These are temporary positions, renewed every six months, without employment benefits (such as health insurance, sick leave, and retirement). The DCF district or region administrator selects and contracts with mental health and substance abuse treatment providers within each of the local communities. These contracts are negotiated with the TANF Specialists and local district administrators. In some communities there is one primary contractor, and in others there are multiple providers. Contracted service providers include a range of agencies, including substance abuse and community mental health centers, residential treatment providers, faith-based organizations, and hospitals. The contracted service providers hire the outreach workers, conduct clinical assessments and provide mental health and substance abuse treatment. Funding mental health services. The Florida legislature allocated $45 million to the TANF SAMH Program for 2001. TANF SAMH dollars are used to pay for the administration and most nonmedical services provided through the TANF SAMH Program. Medicaid covers the cost of medical services, such as medications and psychiatric assessments. Approximately 4 percent of the TANF funds are for administrative overhead and the rest is for direct services. Funding is distributed to each of the 13 DCF districts and 1 regional office using a formula based on the welfare population within the district or region. Funds from the DCF district or regional offices flow down to the local service providers, with whom contract amounts and types of services are negotiated. Monetary reimbursements may vary among the different service providers. Overall, local offices are given broad flexibility in how the funds are spent.